The needlebook has been created using 2 layers of premium wool blend felt containing 40% wool and 60% viscose, the top layer is Orange, the inside is Bright Pink there is a layer of wadding to give the needle book body and stability. This large slouch hobo bag in its llama print is right on trend. I have added an orange cotton lining to contrast with the light grey of the outer fabric. 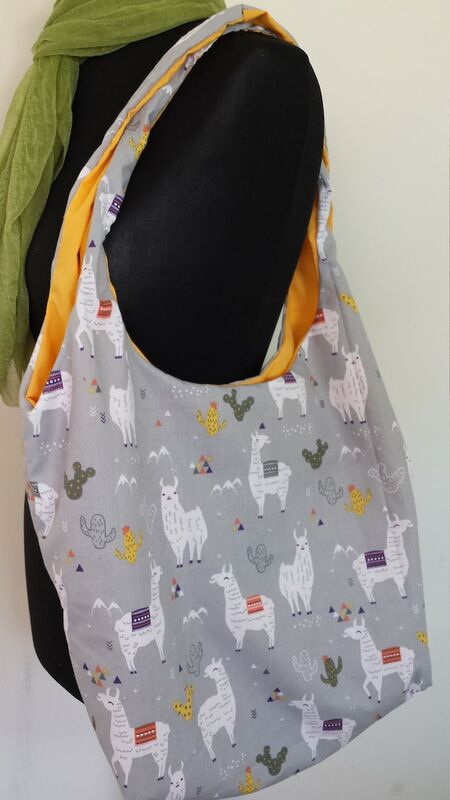 Perfect for summer festivals, beach days or for everyday this fun llama print will be a fun addition to your bag collection. A great gift idea for teenagers, girls and women alike. This cotton apron features a bold tree print which will brighten any kitchen. The apron features an adjustable neck strap for the perfect fit and a double pocket at the front. The long straps mean it can be tied around the back or to the front for your comfort. Tied in ribbon this apron would is ready packaged for a great gift idea. The purse is made in a gorgeous bright and funky fabric .....rows of tiny houses with trees in between...such a pretty fabric! On opening the purse you will see it has been lined with a contrasting sea green-blue fabric. The purse opens with a silver finish kiss clasp metal frame. Some interlining has been added to give the purse some body. Crafted in a fabulous cream cotton fabric with a traffic jam of little blue cars on it from Kokka fabrics. On opening the purse you can see it is lined with a deep turquoise blue fabric. Some interlining has been added to give the coin purse body. 'Hugo 'Baby' Hog' - the Original Watercolour painting of a hand reared baby Hedgehog painted in a slightly 'funky' way. Using this lovely elephant head pendant I've embellished it with white resin cabochon rose. White glass beads, bead caps & 8x5.mm patterened belcher chain form part of the necklace chain which is finished off with patterned 8x5 mm chain with a Tibetan silver hook & eye clasp. The necklace measures approx 20" long. The elephant head drop is approx 6 cm including the bail & 5 cm wide. This feature pendant is a gorgeous Dragonfly in Bright Blue Coated Haematite, it really is a stunning electic blue colour, and very tactile too. It is approx 2 inches across and hangs from a cord of 20 inches. Your pendant will be sent to you in a velvet gift bag. This listing is for a childrens birthday card, suitable for a boy or girl featuring a sweet teddy bear. This birthday card was created using a photograph of our original embroidered and appliqued picture of a vintage style teddy bear. The card and envelope are recycled. The messsage inside the card reads 'Happy Birthday'. 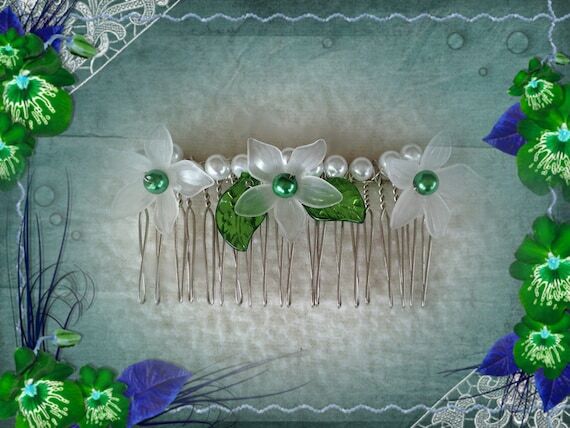 Never have a little mirror just to check your make up or hair, then here is one for you to keep handy in your bag! I have covered these mirrors in a choice of gorgeous Turquoise fabrics.